WASHINGTON (Reuters) - U.S. consumer prices recorded their biggest increase in six months in October on rising gasoline costs and rents, suggesting a pickup in inflation that potentially clears the way for the Federal Reserve to raise interest rates in December. Prospects for a rate hike next month also got a boost from other data on Thursday showing first-time applications for unemployment benefits tumbling to a 43-year low last week and housing starts surging to a nine-year high in October. The reports painted an upbeat picture of the economy early in the fourth quarter and came as Fed Chair Janet Yellen told lawmakers that the U.S. central bank could lift borrowing costs "relatively soon." "Today's data give the Fed more evidence to support a rate hike next month," said Alan MacEachin, corporate economist with Navy Federal Credit Union in Vienna, Virginia. "The only thing standing in the way at this point would be a disastrous jobs report in early December, a remote possibility at best." The Labor Department said its Consumer Price Index increased 0.4 percent last month after rising 0.3 percent in September. In the 12 months through October, the CPI advanced 1.6 percent, the biggest year-on-year increase since October 2014. The CPI increased 1.5 percent in the year to September. Underlying inflation continued to slow last month as healthcare costs moderated after recent hefty gains. But with rents pushing higher, that trend is unlikely to be sustained. The so-called core CPI, which strips out food and energy costs, climbed 0.1 percent last month after a similar gain in September. That slowed the year-on-year increase in the core CPI to 2.1 percent from a 2.2 percent rise in September. The dollar was trading higher against a basket of currencies, while prices for U.S. government bonds fell. The broader PHLX housing index (.HGX), which includes builders, building products and mortgage companies, rose 0.83 percent, outpacing gains on the U.S. stock market. In another report, the Labor Department said initial claims for state unemployment benefits dropped 19,000 to a seasonally adjusted 235,000 for the week ended Nov. 12, the lowest level since November 1973. Claims have now been below 300,000, a threshold associated with a healthy labor market, for 89 straight weeks. That is the longest run since 1970, when the labor market was much smaller. Firming inflation, strong retail sales, an improving housing and manufacturing sector as well as a labor market that is approaching full employment likely satisfy the criteria for the Fed to raise its overnight benchmark interest rate at its Dec. 13-14 policy meeting. Yellen told lawmakers on Thursday that a rate hike "could well become appropriate relatively soon." The Fed this month left interest rates unchanged. The central bank lifted its benchmark overnight interest rate last December for the first time in nearly a decade. Data so far suggests an acceleration in economic growth at the start of the fourth quarter. The Atlanta Fed on Thursday raised its fourth-quarter gross domestic product growth estimate by three-tenths of a percentage point to a 3.6 percent annual rate. The economy grew at a 2.9 percent pace in the third quarter. The stream of upbeat data suggest that president-elect Donald Trump is inheriting a strong economy, which has been credited to economic policies under the Obama administration. Last month, a 7.0 percent jump in gasoline prices accounted for more than half of the increase in the CPI. Rents increased 0.4 percent last month after rising 0.3 percent. Households also paid more for a range of other goods and services last month, including new motor vehicles, apparel, education, auto insurance and tobacco. But they got a respite from food prices, which were unchanged for a fourth straight month and food consumed at home declined for a sixth consecutive month. Medical care costs were unchanged for a second month and prescription medicine price increases also moderated from September's strong gain. 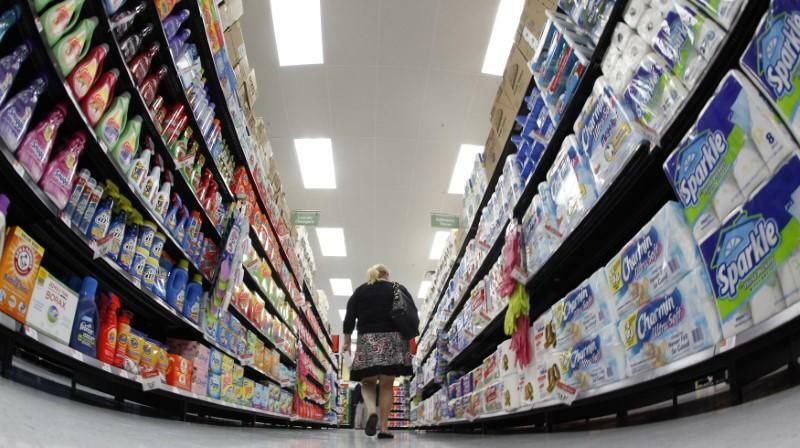 Falling food prices are, however, hurting retailers like Wal-Mart Stores (WMT.N). The world's largest retailer on Thursday reported lower-than-expected quarterly sales at established U.S. stores. With the labor market firming and rents rising, housing is getting a lift. In a third report, the Commerce Department said housing starts jumped 25.5 percent to a seasonally adjusted annual pace of 1.32 million units last month, the highest level since August 2007. The percent increase was the biggest since July 1982. Starts increased in all four regions last month. Single-family homebuilding, which accounts for the largest share of the residential housing market, jumped 10.7 percent to a nine-year high. Housing starts for the volatile multi-family segment soared 68.8 percent. Housing market strength is spurring demand for televisions and home theaters, fattening profits for retailers such as Best Buy (BBY.N). The largest U.S. electronics retailer reported a bigger-than-expected rise in quarterly profit and same-store sales on Thursday.